My name is Marc Sutherland and I took part in the Review’s 1000 Voices North event at Inverness College UHI. I was encouraged to go along by my advisor at Skills Development Scotland due to my past life experiences and my interest in working with young people. When initially arriving we discussed the reasons behind the event and were told that through our own shared experiences we could make positive changes to the lives of looked after children. We then broke off into smaller groups where we went to separate rooms that were more private to discuss our positive and negative experiences through activities with the young people. During these activities it quickly became clear how enthusiastic everyone attending was and they wanted their voice to be heard. 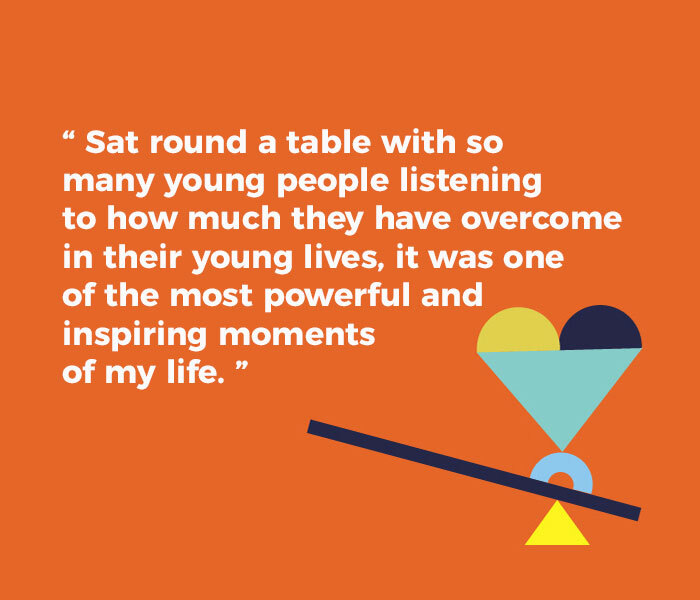 In the past I have only ever heard one young person’s experience at a time, but when I was sat round a table with so many young people listening to how much they have overcome in their young lives, it was one of the most powerful and inspiring moments of my life. It made me realise how much of a privileged position I was in, being 25 and that I had come out the other side, so to speak. It allowed me to reassure the young people that things do get better and their experiences do not define who they are, but the lessons they learn will help shape the person they will become. When we returned to the main theatre I was honoured to be asked to close the evening with some positive words from my own experience. I reassured the young people by telling them how strong their experiences make them. Going through this prepares us for situations in the future that our peers may not have experienced and we may have to work harder than them to reach the same milestones, but it means more to us because of it. Having people from similar backgrounds around young people helps them to open up and reassures them that their voices will be heard, and the changes they want to see will be carried out to the best of the ability of the Independent Care Review and 1000 Voices. When I was young my automatic reaction was that people never understood, and in my opinion there is no one better to understand what looked after children and young people are going through than people that have come out the other side. I have seen this first hand through volunteering with other organisations and my work as a support worker for young people. What 1000 Voices achieved was to let young people and adults know that together their voices will be heard loud and clear. This will enable us to make the positive changes needed for the future of our young people in Scotland. Marc, Well said????. I am a foster carer and growing up my mum used to drink . On the outside we looked like any other family. My mum was a lovely lady but drinking was a big part of her life and I felt that my sister had to take on the roll as mother figure. This has made me a independent person who learned to cook and look after myself from a very young age. At 18 I got married and had my son, I am pleased to say that we are still married and very happy. It was not always easy but by supporting each other (husband, sister, my son ) we have a very good well balanced life that we love to share with the kids that we welcome into our family. My sister is also a foster carer and has done this for many years so we share our experiences and use the same practice with the kids we care for by keeping kids safe,healthy and happy in our care. We also still support them when they become young adults and make there own way in life. Hi Margaret, thank you so much for your lovely comment!